It is typically organized and monitored by the scrub person or surgical technologist assisting in the procedure. It is used in conjunction with a stand so that the tray and instruments are situated above the waist and easily accessible during the procedure. 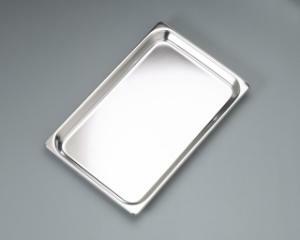 The tray holds instruments that are the most frequently used during any given procedure. The tray is available perforated or non perforated and in a variety of sizes. Stainless steel material.